Today's sketch at SCS is a pretty simple one - the triangle piece in the sketch is actually a 3-5/8" square cut in half. I started off with the square piece and did the Faux Handmade Paper Technique - which really started a debate on TJ as to which toilet paper was best for that technique. 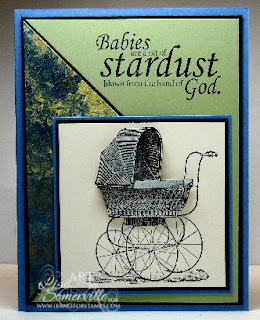 My main panel uses the Antique Buggy from I Brake for Stamps. I stamped the image two more times and cut portions and popped them up on dimensionals. I stamped the Stardust sentiment in black to fill in the empty space at the top of the card. This is just gorgeous. What new mom wouldn't love to receive such a spectacular card with a gift. Beautiful!